I have put together a collection of my best ground beef recipes that are nutritious and tasty. We all love to discover delicious and simple ground beef recipes, so when I find one that is easy to make and that my whole family loves, I hold onto it and use it over and over again. Ground beef is so versatile. It can be used it in so many ways – from making meat balls, burgers, casseroles, curries, meat loaf and bolognaise! I prefer to use lean ground beef to minimise our saturated fat intake. I often substitute ground beef for ground venison which can be very similar in taste and is much lower in saturated fat. You could also use ground lamb instead of beef. A great way to make sure you don’t get any undesirable cooked lumps of ground beef is by using a fork or wooden spoon to squash out all the lumps as you are browning the mince in the pan. That will ensure that you have a wonderful lump-free dish. Beef and Noodle Casserole - Simple, healthy ground beef casseroles recipe even your pickiest eater will love. Ground Beef Casserole - Another favorite on our healthy, cheap dinner recipes list these simple ground beef recipes are sure to please! Mom’s Beef Curry - Another of our easy recipes for ground beef that's mild enough of kids. Tasty Burger Recipes - Tomatoey Beef Burgers - This tomatoey beef burger recipe is a kid pleaser. 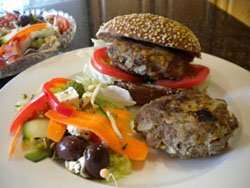 Warren’s Tasty Burger Recipes - Looking for healthy, quick ground beef recipes? Check out Warren's beef burgers. Why not become part of the Healthy Eating Website! All you do is share your best ground beef recipes or any other favourite recipe right here! Have A Scrummy Ground Beef Recipe? Do you think you have the best ground beef recipe? Share it!